In 1966 to 1968, The Family Dog, under Chet Helms, produced 4 concerts at the Fillmore Auditorium, 140 concerts at the Avalon Ballroom, and 16 concerts in Denver Colorado as the Denver Dog. The recognized Family Dog poster series is 147 posters, comprised of all the Fillmore and Avalon posters, and 3 of the Denver dog posters that were numbered in the regular series. The remaining 13 Denver Dog posters are usually thought of as a separate group. Most of these posters were printed more than once, with a quantity printed before the concert and a second and third printing after the concert. The first posters pre-concert run was quite small, with FD-1, the first poster in the series, being less than 300 posters, probably. As the concerts, and the posters, became more popular, the concert poster runs grew to 1000 posters, then to 2500, then, by FD-44 to 5000. After FD-42, postcards were also printed alongside the posters. Before FD-42, the earliest numbered Family Dog handbills (#1 -- #10) were printed on 5 x 7 stock; with a variety of color variants. Most of these handbills are very rare and, in some cases, can command asking prices in the thousands of dollars. Handbills from FD #11 through FD #20 varied between 5 1/2 x 8 1/2 and 8 1/2 x 11 stock. From FD #21 through FD #41, handbills were printed on 8 « x 11 stock (except for #28, which is 5 x 7). The later ones (from #26 on) are in color but some have color variations from the corresponding posters. None of these early handbills were ever reprinted, though there are different color and print variants for some numbers among the originals. Bootlegs of several early numbers also exist. The challenge for serious collectors is to assemble a complete set of these first 41 handbills. ​ Beginning with FD#42, all FD cards were printed in postcard size like the Bill Graham cards, and numerous printing variations exist among these, as well as different types of card backs. The standard back is the postcard back with a swirly drawing and place to put a stamp. Bulk rate card backs were also printed and these were intended for mailing to the Family Dog mailing list. Many different reverses exist and these don't have a huge impact on the value at this point in time. ​ The Family Dog also produced shows in Denver, Colorado, and these shows have a "D" prefix. Some have dual numbers, e.g., FD #84 = FD#D-4. After the Family Dog left the Avalon Ballroom, they continued to produce shows on the Great Highway. While the latter bear the Family Dog logo, they are not part of the numbered series. 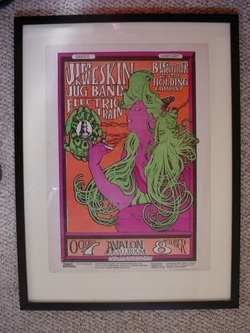 "The Collector's Guide to Psychedelic Rock Concert Posters, Postcards and Handbills 1965-1973" has, after many years digging and hard work, been able to catalog and make some sense of all the different posters and their printing history. This alone has made the collecting of this part of rock and roll history possible, and a great debt is owed to him for what has become his lifelong passion. Most of the images of the Family dog posters can be seen at a San Francisco oriented site, Chicken on a Unicycle, along with images of all the venues, histories and insights into San Francisco scene, and just some other far out stuff. July 31, 2013 I have completed my collection of all the Family Dog posters in the Avalon era, both in San Francisco and in Denver. An image set, with enough firsts to make it interesting.